Seven goals, a 98th minute winner, 11 cautions and six red cards. 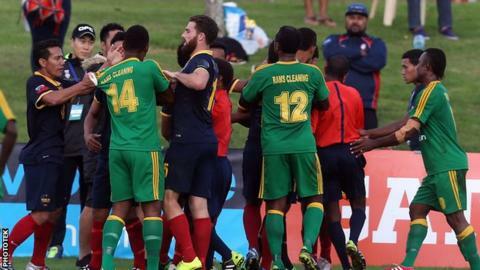 Was this clash of the Pacific Islands the most action-packed football match ever? Kiwi FC from Samoa had raced into a 3-1 lead against Fiji's Nadi FA after 21 minutes in their OFC Champions League football group match in Auckland. Both sides were then down to 10 men for the second-half after Desmond Faauiaso and Waisake Tabucava were both sent-off for their part in a fracas just before the break. Kiwi FC looked set to earn their first ever win in Oceania's premier club competition, but with 10 minutes to go the drama really began. Nadi goalkeeper Vereti Dickson and Kiwi's Lionel Taylor were sent-off after a melee in the 81st minute before Nadi's Anish Khem scored his second of the game. But seconds later Kiwi substitute Lawrie Letutusa saw red to leave his side with eight men. Referee George Time, from the Solomon Islands, signalled nine minutes of extra time and Khem took full advantage, completing his hat-trick in the 96th minute. His side were soon also down to eight men as Napolioni Qasevakatini received red card number six before Khem scored his fourth goal and the winner. "The discipline of some of the players let us down and we will now be lacking in numbers for the next game, which is a tougher one," said Nadi coach Kamal Swamy after the game.